The Watchmen comic books definitive collecting guide absolute, hardcover, and trade paperback collections. Part of Crushing Krisis’s Crushing Comics Guide to Collecting DC. Last updated November 2017 with titles scheduled for release through January 2017. 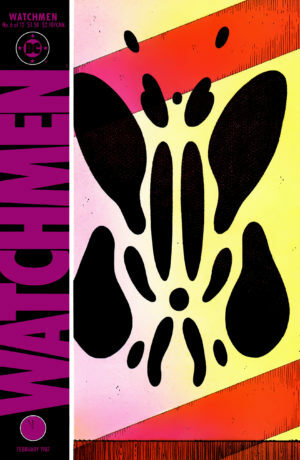 Alan Moore and Dave Gibbon’s Watchmen is widely recognized as one of the most classic single comic stories in the history of the medium. The same traits that make Watchmen a prohibitive classic can also make it a challenging for modern readers. That’s not just because they might lack the historical context or comics knowledge for this series. Instead, it’s because since Watchmen (and also The Dark Knight Returns, released in the same year) American superhero comics have evolved a sense of self-awareness that echoes the narrative tone of this series. 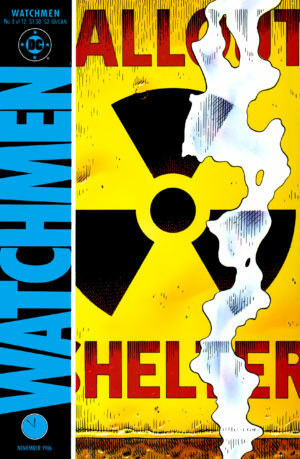 Watchmen existed for over 20 years as a completely self-contained series with some minor background material included in its collected editions. That all began to change with the 20th Anniversary of the title, which brought a modern restoration to its colors, continued through 2009 with the release of Watchmen’s film adaptation, and seemed to reach its peak in 2012 with a series of Before Watchmen comic books that expanded the universe of the original series for the first time. However, DC Comics saved the biggest expansion of Watchmen for its 30th Anniversary, revealing that the actions of Moore and Gibbons’s characters had somehow created the “Rebirth” of their entire comic line. After a year-and-a-half of teasing, that story began to be told in Doomsday Clock, another 12-issue series that picks up from just after the final scenes of the original Watchmen to integrate its characters into DC’s current continuity. The cast of Watchmen are all original characters. Except that they aren’t. They’re largely thinly-disguised versions of Charlton comics characters, which DC Comics had acquired in 1983. At the time he pitched the series, Alan Moore’s star was rising as the result of his landmark run on Swamp Thing and his inspired reinvention of the Shazam-knockoff Marvelman AKA Miracleman. Moore wanted to do more of the same in his original pitch for Watchmen, taking some disused group of heroes and writing their inevitable decline into irrelevance, mistrust, and megalomania. That was the initial idea of Watchmen—and this is nothing like what Watchmen turned out to be—was it was very simple: Wouldn’t it be nice if I had an entire line, a universe, a continuity, a world full of super-heroes—preferably from some line that has been discontinued and no longer publishing—whom I could then just treat in a different way. You have to remember this was very soon after I’d done some similar stuff, if you like, with Marvelman, where I’d used a pre-existing character, and applied a grimmer, perhaps more realistic kind of world view to that character and the milieu he existed in. So, at this point, I came up with this idea regarding the MLJ/Archie characters, and it was the sort of idea that could be applied to any pre-existing group of super-heroes. If it had been the Tower characters—the T. H. U. N. D. E. R. Agents—I could’ve done the same thing. The story was about super-heroes, and it didn’t matter which super-heroes it was about, as long as the characters had some kind of emotional resonance, that people would recognize them, so it would have the shock and surprise value when you saw what the reality of these characters was. When we were just planning to do an extreme and unusual super-hero book, we thought the Charlton characters would provide us with a great line-up that had a lot of emotional nostalgia, with associations and resonance for the readership. So, that was why we put forward this proposal for doing this new take on the Charlton characters. If we had used the Charlton characters in Watchmen, after #12, even though the Captain Atom character would’ve still been alive, DC couldn’t really have done a comic book about that character without taking away from what became Watchmen. So, at first, I didn’t think we could do the book with simply characters that were made-up, because I thought that would lose all of the emotional resonance those characters had for the reader, which I thought was an important part of the book. Eventually, I realized that if I wrote the substitute characters well enough, so that they seemed familiar in certain ways, certain aspects of them brought back a kind of generic super-hero resonance or familiarity to the reader, then it might work. Generally, when Charlton characters were absorbed by DC Comics they and their stories were relegated to “Earth Four,” a designation for an Earth that was devoid of parallels of DC’s iconic characters. During Crisis of Infinite Earths, that Earth was destroyed, though several of its characters – notably The Question, Blue Beetle, and Captain Atom – were adopted by DC’s main continuity. 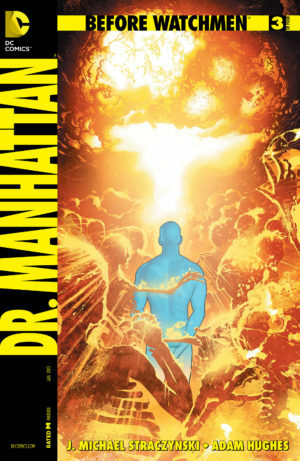 Dr. Manhattan – A living embodiment of the atomic era who lives free of the constraints of time and space but within an inescapable void of his own loneliness. Based on the Charlton Comics character Captain Atom, who was brought into the DC Universe after Crisis and would become a Justice League and JSA mainstay. Nite Owl – A gadget-wielding street hero in a tech suit. While Nite Owl might seem like the Batman of the group, both incarnations of the hero are definitely based more on the Charlton character Blue Beetle, a regular of the modern DC Universe since Crisis. Rorschach – A hyper-violent, morally absolute vigilante with a constantly-shifting mask. Based on Charlton Comics character The Question (Vic Sage), who was later absorbed into DC proper after Crisis. Also similar to another Ditko character, Mr. A., for whom The Question was a Comics Code-appropriate replacement. Ozymandias – The world’s smartest man who once focused his intelligence on the exact control of his body, but now uses it to make millions. Based on the Charlton Comics character Peter Cannon AKA Thunderbolt. The current rights to this character are with Dynamite Entertainment. Silk Spectre – Once a WWII era bombshell, now reinvented as a slick, spandexed young street hero. Unlike her male counterparts, neither version of Silk Spectre is based on a Charlton comics character. Her look and fighting style is somewhat influenced by Black Canary and Phantom Lady, but she has no direct analog in an existing female character. 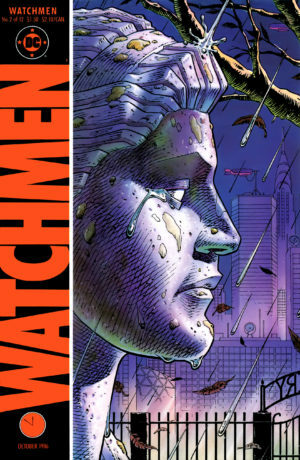 As one of the seminal works of the comic medium, Watchmen has been reissued more than nearly any other run of a modern comic book in a dizzying sequence of formats. 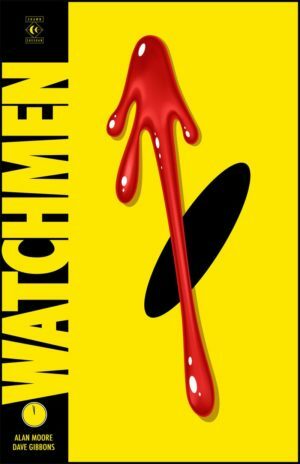 Deluxe Edition Paperback – The trade paperback of Watchmen has gone back to press over thirty times, but due to it having the same cover with limited differences in the pull-quote and yellow tone, it’s nearly impossible to know which version you’re looking at without reading the indicia. This edition (which now appears to be the standard paperback re-issue) can be distinguished from other versions by its having a plain yellow smiley face cover with no text and in including special features found in the Deluxe Hardcover and Absolute editions. Watchmen TP International Edition – DC Comics does not hold the trademark to market using a smiley face in Europe, so for all Watchmen-related products they must produce a non-smiley cover for international sales. This edition currently appears to have last gone to press in 2014 as ISBN 978-1401248192. Original Graphitti Hardcover – The original 1988 slipcased hardcover collection. This is not oversized, had a limited print run, and did not have an ISBN. It was the first time Watchmen was presented alongside bonus material. Visit the My Absolute Collection blog for a nice write-up on this edition. Deluxe Edition HC – DC solved their international marketing problems by simply using the international cover for their entire run of most recent Deluxe Editions. Now that the paperback edition mirrors this bonus content, the main reason to pick this up is for the slightly oversized artwork – this edition is 11 inches in height, the standard size of oversize hardcovers and omnibuses. Watchmen Collectors Edition Box Set (2016) – This is a peculiar artifact. For the low price of $10 per issue, each issue of the original comic run is immortalized in its own single, oversized hardcover. Each book features the color restoration of a single issue from the Absolute edition on matte (i.e., not shiny) paper. It’s effectively a modern presentation of something akin to having the original comic books. Absolute Edition – This slipcased Absolute edition (with updated colors) was first issued for the 20th anniversary of the series, but DC has kept this continuously printed since then as they have with the Sandman Absolutes. Absolutes measure 13 inches in height and are generally one of the highest quality comic reprints currently on the market (comparable to Dark Horse Library Editions). Note that this color update is not an update to modern digital colors with gradients, but more of a restoration job. Watchmen Noir Hardcover – This oversize hardcover edition presents the comic without any colors – it’s in its final black-and-white inked format with lettering. DC has marketed this format (and a similar “unwrapped” format that is pencils-only) for modern comics by major artists like Jim Lee to great effect. Dave Gibbon’s artwork has a a very different impact in black and white – it’s not full of bombast like Lee, but instead has an understated, almost Silver Age quality to it. This shouldn’t be your first read of the series, which makes marvelous use of color, but is a good supplement – especially if you’re reading as much for the art as for Moore’s writing. 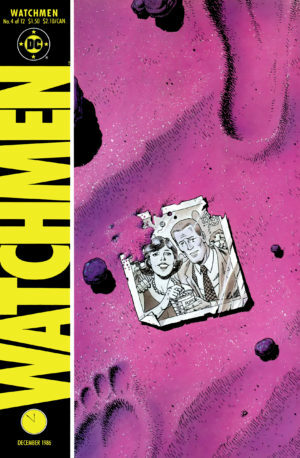 Dave Gibbons’ Watchmen Artifact Edition (2014) – IDW’s “Artifact” series reproduces original penciled pages – pre-inks and colors, but often including corrections. This edition presents pages from all of the issues of Watchmen, though not necessarily complete issues. Read more on IDW’s product page. Watchmen: The Annotated Edition (2017) – This edition presents the full Watchmen series alongside annotations that are drawn from interviews with Dave Gibbons and scholarly critique. One of the benefits of this edition is that it helps to unpack the dense references of Watchmen, including nods to literature and current events, as well as Gibbons complex panel work. Watchmen: The Complete Motion Comic (DVD / Blu-Ray / 2-Pack w/Black Freighter / Digital) – This fascinating edition treats the original comic book as animated storyboards, using digital papercut-style techniques to transform the comic into a cartoon by lifting the characters off their backgrounds. The somewhat odd thing about this presentation is to use a single narrator for the entire voice-over rather than a cast of voice actors. This version is packaged alongside some of the deluxe editions of the Watchmen live action movie, as listed below. 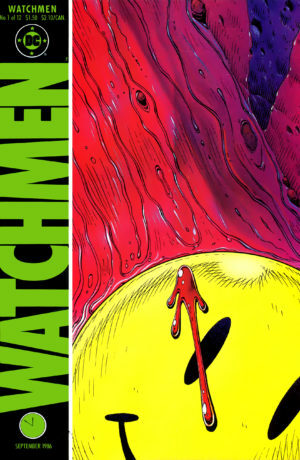 Watching the Watchmen Hardcover (2008) – Described as “The Definitive Companion to the Ultimate Graphic Novel,” this book opens up Dave Gibbons’ personal archives and interviews him extensively. 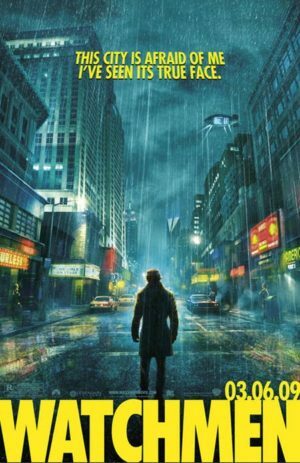 Watching Time: The Unauthorized Watchmen Chronology (2016) – This unauthorized guide isn’t just a companion to the original series, but to Watchmen across all forms of media. It exhaustively recreates a timeline of all of the in-universe events depicted in Watchmen (such as many adventures of the Minutemen and their fates), but also collects Watchmen references from other media – like a DC role-playing game. The most appealing aspect about this book for me is that it’s very well-sourced, even taking the time to note when two of its sources conflict on a background detail. Who’s Who: Update ’87 (1987) #5 – This “Definitive Directory of the DC Universe” presented single page pin-ups with short bios of each comics character (it is much less comprehensive than Marvel’s “Official Index”). However, The Watchmen merited a full-page Gibbons pin-up and a separate page of text synopsizing the pre-history of the comic as well as its plot. The more remarkable note is that the Watchmen are pictured as a team in action on the rear of the cover illustration – something we never see in the comic! The Question (1987) #17 – Rorshach appears for a single page dream sequence after The Question reads Watchmen on a long plane ride. It doesn’t amount to much – he could be replaced by nearly any other fictional vigilante and the scene would read the same. Kingdom Come (1996) #2 – Rorschach makes a blink-and-you’ll-miss-it cameo deep in the background of a panel in an issue packed with a litany of cameos. Flying Colors 10th Anniversary Special (1998) – A pin-ups book celebrating a comic shop. Contains a Rorschach pin-up. Before he became the man behind DC’s integrated cinematic universe, Zach Snyder sat in the directors chair for a slavishly faithful big screen adaptation of Watchmen in 2009. Aside from a few inserted moments and one significant change to the finale, the film stands as one of the most straight-forward screen versions of any single comic property. Snyder and DC even animated the Tales of the Black Freighter to insert into a special extended cut of the film! That unflagging devotion to the original series is both a strength and a weakness for the movie. Watchmen is specific in its deconstruction of decades of comic story tropes and character archetypes, but also of the medium itself. While a film can mimic all of the plot beats and feature the characters, it couldn’t hit the mark when it came to dissecting the comic medium. Perhaps that was because the film could only mock comic tropes and not so much comic film tropes. We were still so early in the cinematic Silver Age of comic book films – still three years shy of The Avengers movie. Despite that limitation, Snyder’s film holds up for pre-existing Watchmen fans and comic buffs in general. To the best of my knowledge, the theatrical cut was never released on Blu-Ray! This version inserts a number of extended and deleted scenes to lengthen the film by 24 minutes. It is my preferred version for re-watches (of which I have done many). It was also issued in collectible editions – Best Buy Exclusive (Dr. Manhattan head) and Amazon Edition (Nite Owl ship). The “Ultimate Cut” is the Director’s Cut film with Tales of the Black Freighter completely integrated into the edit to mirror its placement in the comic. The original DVD and Blu-Ray box set versions included a second disc contains special features, a third a digital copy, and a fourth disc of the Watchmen: The Complete Motion Comics, a animated and narrated version of the original comic panels. The Collector’s Edition included the Ultimate Cut Blu-Ray, the theatrical cut DVD, and the Motion Comic Blu-Ray. The later 4K version omits the extra discs, but comes with a Blu-Ray copy of the Director’s Cut. A standalone version of Black Freighter as its own animated feature, along with a produced mock-documentary of about Hollis Mason. This was also repackaged as a two-pack with the Complete Motion Comic. Originally released digitally, this two-part game includes a pair of adventures for Nite-Owl and Rorschach from their partnered days a decade prior to the film’s continuity. In 2012, DC drafted four notable comic authors to extend Watchmen’s story with a number of official prequels – Brian Azzaerllo of 100 Bullets fame; Darwyn Cooke, who created DC’s New Frontier; J. Michael Staczynski of TV’s Babylon 5 and a lengthy run on Amazing Spider-Man; and Len Wein, a late Silver Age writer who created Wolverine and the second generation of X-Men! Each creator was tasked with penning 10 issues of the project split across two series, except Wein who wrote seven issues plus a series of two-page Crimson Corsair backups across the individual issues. Each series was handled by a single illustrator who both penciled and inked their own work, except for Andy Kubert on Nite Owl inked by his father, Joe. This included a handful of special bookings of pencillers who very rarely work on multiple sequential issues, such as Jae Lee and Adam Hughes. While the announcement of the project created a major splash, it didn’t make an equal impact in sales or with critics. A proposed epilogue was never published. It’s hard to say exactly why the project fizzled. Are there just not that many dedicated Watchmen fans out there? Or, did the series simply not bring the quality of their legendary source material? You can decide for yourself. While all of the series add definition to the world of Watchmen, there are a handful of details of special note. Cooke’s Minutemen series heavily retconned many implied elements of the original Moore story, JMS’s Dr. Manhattan adds significant new powers and history to the character, while Wein’s Ozymandias is a flashback from the final moments of Watchmen. In terms of reading order, without splitting up single series one potential reading order is Minutemen, Dollar Bill, Silk Spectre, Nite Owl, Comedian, Moloch, Rorschach, Ozymandias, and Dr. Manhattan (which, in a way, occurs as a cutaway from Comedian’s funeral in Watchmen itself). In reality, some of the series intersperse with the others (Comedian, Ozymandias), but this order defers to whatever ends first. Contains Comedian #1-6 (illustrated by J.G. Jones) and Rorschach #1-4 (illustrated by Lee Bermejo). Contains Nite Owl #1-4 (illustrated by Andy & Joe Kubert), Dr. Manhattan #1-4 (illustrated by Adam Hughes) , and Moloch #1-2 (illustrated by Eduardo Risso). Contains Ozymandias #1-6 (illustrated by Jae Lee), the Crimson Corsair backups compiled into a single tale (illustrated by John Higgins, who also handled some of the scripting), and the Dollar Bill one-shot (illustrated by Steve Rude). 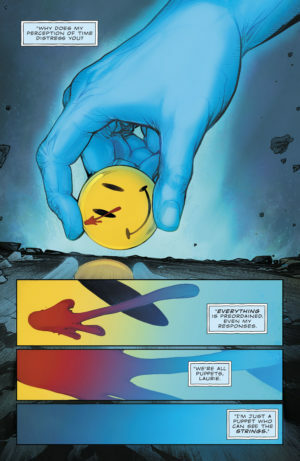 Thanks to a certain bloody yellow button in DC Universe: Rebirth Special, longtime DC readers were tipped off that The Watchmen were a factor in DC’s Rebirth, a line-wide relaunch in the summer of 2016. However, DC editorial was ready to play a relatively long game when it came to a full reveal of how The Watchmen were entangled with the DC Universe, including somehow “stealing” 10 years of their chronology to create the stitched-together continuity of New 52. Despite many small nods to Watchmen in 2016, (especially in Titans), there were no overt links in their comics until a year later with a Batman and The Flash four-issue crossover called “The Button” that focused on that mysterious pin. Collects Batman (2016) #21-22 and The Flash (2016) #21-22. Even that story only glancingly featured any Watchmen. Instead, it explored how several DC timelines previously thought to be dead (particularly Flashpoint) still somehow exist suspended in time. This, in turn, tees up the definitive story, Doomsday Clock, a year-long, 12-issue maxi-series beginning in November 2017. This story picks up Watchmen just after its close, exploring the ramifications of the release of Rorschach’s journal (but somehow also featuring a living Rorschach!). 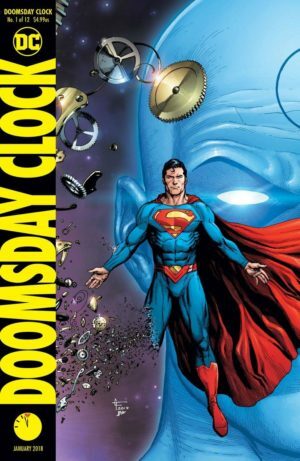 The modern day portion of the story is told in DC’s continuity as of December 2018, meaning that all of their comics will be playing catch-up to Doomsday Clock for the entire next year. Check Amazon for DC’s newest Watchmen titles.